The Team WebDevOps is a Project that is aimed to produce a couple of Projects to make Web-Development and common DevOps tasks easier. We want a distinct Documentation for each Project, which is why we split each documentation to be handled by the Project itself. This way we can assure that each Project Documentaton can grow alongside with the Project itself and you are able to Switch the versions of the Documentation for each Project. In the left sidebar, you can find links to our Project documentations. 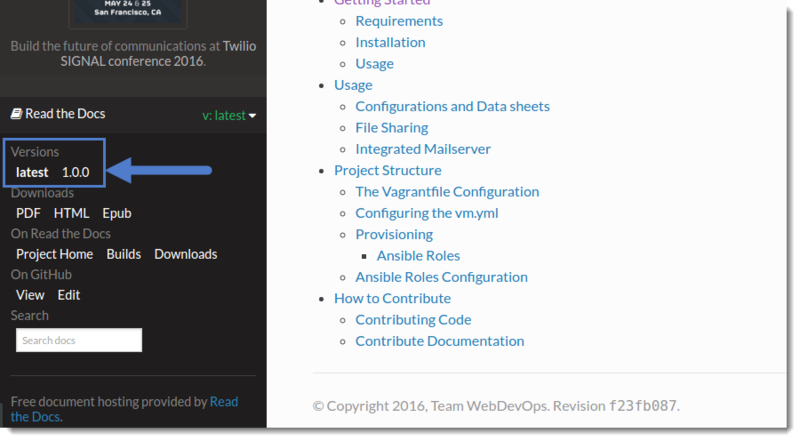 Each documentation has an additional menu on the bottom to allow you to switch between versions of the Project Documentation. The Versions are aligned with the current tags of the GitHub Repository and start with the first version released with this documentation. The latest version of the documenatation will correspond to the current master (or actively developed branch). © Copyright 2016, Team WebDevOps. Revision 33acce3e.